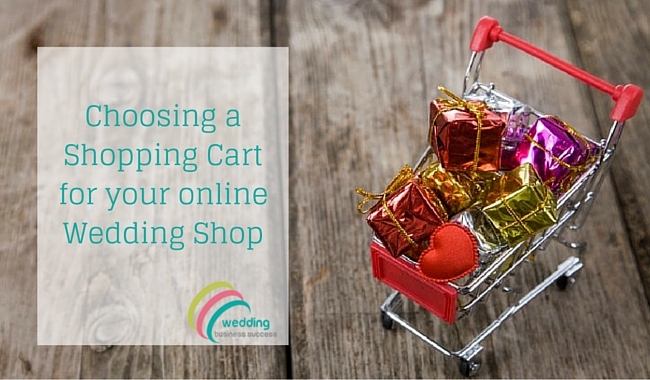 In previous articles we’ve talked about using Marketplaces like ebay and Etsy to sell your wedding products online. Sooner or later, however, you’ll want to have your own online shop. Which means choosing an ecommerce Shopping Cart. There are hundreds of options available so how do you choose the one that’s right for you? Before you start looking at individual solutions it’s important to understand the different ways to set up an ecommerce store. Often used with WordPress websites, these are addons to your own website. Woocommerce is the most widely used. While a plugin is fine if you only have a few products, for more complex businesses you’ll probably want to look at a website based around a shopping cart developed specifically for ecommerce. If you do go down the plugin route, make sure it is set up properly. Your website performance can be badly affected by poorly integrated or too many plugins. Nobody buys from slow websites. You pay a monthly fee and everything you need is provided for you – the cart software, hosting, links to payment gateways. This is the fastest way to launch your ecommerce store and is a low investment option for testing a new concept or product. You can usually set these up yourself without help but you may find it beneficial to get an expert in to do it for you. Many businesses choose this option and then move up to a more customised solution once they have learnt which features really matter to them. Open source means that the software is free – but you have to download it and customise it to set up your ecommerce website. Usually a web developer will do this for you (many ecommerce website developers will be using open source carts as the base for the websites they design). Although you’ll need to invest more up front, once you are up and running you own and control the site and there is no ongoing monthly fee to pay (other than payment handling and web hosting). Magento is the big player in this space – it’s a very serious ecommerce platform used by major retailers and probably not the best option for beginners. But there are other options such as oscommerce (my previous business, the Wedding Crafter was initially built on oscommerce and it’s still a popular choice today) and OpenCart. Getting a complete ecommerce website built from scratch is usually an expensive option and not recommended for your first online shop. For one thing, until you have been running for several months, it’s likely you won’t have a clear idea of exactly what you need. Secondly, there are so many existing platforms available that there is no need to re-invent the wheel. Don’t consider this option unless what you are planning is completely unique and impossible to even trial with something that already exists. If you go to a web developer this is likely to be the option that they will offer. They will use a plugin, a hosted or an open source shopping cart and then customise it to create the ecommerce site you need. It’s important to understand what solution they are offering as this will have implications in terms of on-going costs, upgrade options and what happens if you fall out with them (or they go out of business). Understanding the different ways to set up your online shop will make it much easier to evaluate and choose the right option for you. You’ll want to make a list of all the features you think you’ll need and then start investigating the solutions that meet your requirements. Talk to lots of people, including web developers and take your time – this is a big decision and one that’s important to get right.